When: Sat., June 22, 3:30-5:45 p.m.
Trinity Ballet Academy of Mckinleyville presents dancers ages 4- adult performing ballet classics, including "Paquita Variations" and a Fourth of July tribute. This is a great show for all ages. Purchase tickets at theater door on Saturday, June 22 . Doors open at 2:30. 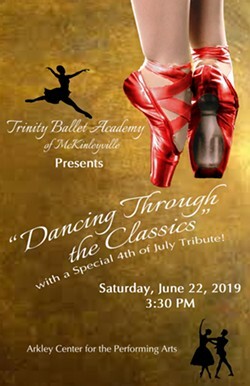 Call 839-1816 or see Trinity Ballet Academy's Facebook for other ticket purchasing options .